From misty blue-tinged mountains to soothing, sandy coastlines, the Carolinas boast no shortage of appealing attractions — not the least of which are culinary charms like world-famous BBQ and Southern-style cuisine. But beyond pulled pork and fresh-catch seafood, the region has become a surprising haven for all things plant-based. Notable veg-strong eateries have sprung up throughout both states, and chefs are making their mark with mouthwatering vegan and vegetarian options. With locations in both Charlotte and Asheville, Bean is a local legend. With an extensive menu that boasts satisfying, Southern-inspired comfort food, it’s a hotspot for vegans and omnivores alike. 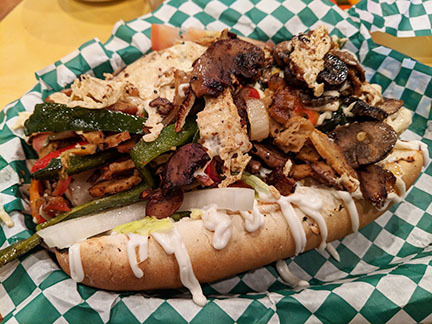 It seems that everyone loves Bean, and owners Roy Parkhurst and Charlie Foesch are committed to their mission of making totally delicious food that doesn’t harm animals, the planet, or the health of their patrons. While it’s tough to make a decision when presented with so many selections, recommended dishes include the pimento cheesish dip; the buffalo fried cauliflower with blue cheeseish; the cowboy burger with seitan bacon, Daiya cheddar, onion rings, pickles, BBQ sauce, and ranch dressing; the cheesesteak hoagie with homemade grilled seitan topped with peppers, onions, mushrooms, Daiya mozzarella, Vegenaise, shredded lettuce, tomato, and onion — and any/all of the homemade desserts, which include a raspberry zinger cake, a rich, peanut buttery kitty kat cake, and a rotating selection of cheesecakes. Chef/co-owner Jason Sellers is a culinary notable. The purveyor of Plant has earned nods from coast to coast for his meticulously prepared, locally sourced creations. The intimate eatery offers a small, frequently-changing menu that highlights Jason and team’s favorite ingredients — plus, craft cocktails and organic, biodynamic wine selections. While the menu shifts seasonally, some selections tend to stay. Opt for the raw lasagna with heirloom tomato, live herbed almond cheese, marinated pepper, beets, arugula, arugula-pecan pesto, micro greens, and oregano-infused olive oil; the insanely savory cheese plate with aged cashew, farmer’s involtini, rosemary amber and fruit, pickled vegetables, black garlic oil, and focaccia; or the hearty seitan chile con queso with ramp'd tamale, grilled farm romaine and cilantro mojo, and pickled jalapeno and onion. Known as a vegan mecca in Asheville’s charming, colorful River Arts District, Ultra Coffeebar is loaded with plant-based options. Open for both breakfast and lunch, there are all kinds of options, from more traditional-style breakfast choices and baked goods to healthy, fresh salads and wraps — all with an open air patio. Highlights include the avocado toast with pickled onion, balsamic glaze, and sea salt; the insanely popular Viva La Vegan, a toasty everything bagel topped with grilled tofu egg, vegan cream cheese, and tempeh bacon; and the Thai wrap, a spinach herb tortilla packed with coconut curry hummus, peppers, cucumbers, pickled carrots, spring mix, tomato, and sweet chili sauce. In the three years since its inception, Sanctuary Brewing Company has become a cornerstone of the tight-knit community of Hendersonville (affectionately known as Hendo). After finding success with their focus on philanthropy, animal advocacy, and amazing craft beer, brewery owners Lisa McDonald and Joe Dinan recently decided to add a vegan eatery to the mix. 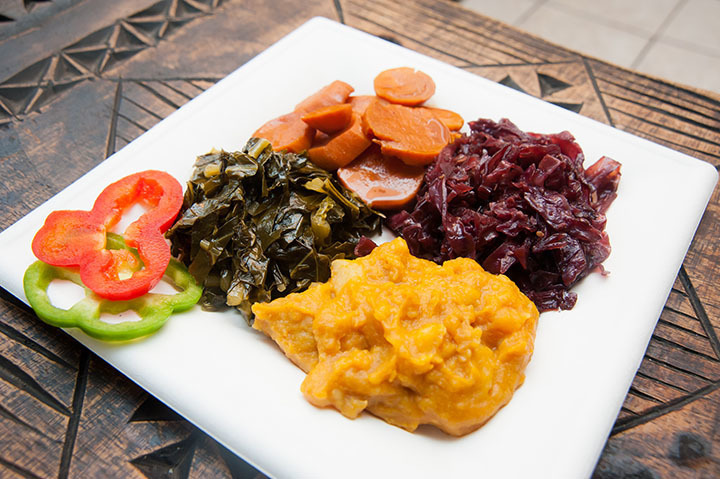 Helmed by owner and notable chef (and PBS TV star) Laura Theodore, The Jazzy Vegetarian Vegan Cafe will offer healthier, plant-based versions of pub food favorites including burgers, hot dogs, pizzas, chili and even a special menu just for kiddos. All of which pairs perfectly with beer, obviously. Another addition to Hendo’s vegan lineup is the once-monthly Hendo Supper Club, a troupe of vegans, vegetarians and omnivores that hit up the town’s best eateries for custom-created plant-based meals. All are invited (via the Facebook group) and past venues have included Never Blue, Postero, and Sol Y Luna — each of which designed a special vegan menu for the ever-expanding group of foodies. No list of vegan eateries in Western North Carolina would be complete without including Garlik, a new, family-owned outpost tucked into a little town just outside of Hendo. The menu is extensive, and includes everything from a daily, homemade soup selection to stir-fry, sandwiches, apps, and the house specialty — pizzas. Try the taco pizza with tempeh, mozzarella, cheddar, lettuce, tomatoes, black olives, and onions; the white pizza with basil, spinach, sun-dried tomatoes, cashew cheeze and mozzarella; or the alfredo chik’n with chik’n, tomatoes, mozzarella, and alfredo sauce. While Outer Banks destinations are usually more about shrimp and oysters than vegan-friendly eats, OBX Bites is in a league of its own. Owners Valerie Wagner (vegan) and Paul Watson (omnivore) were determined to create an eatery that offered something for everyone. 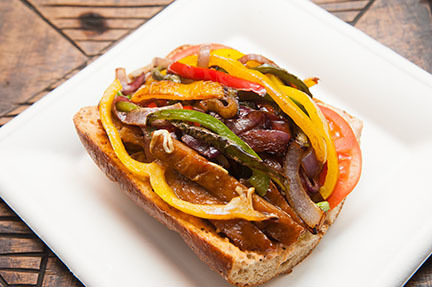 The menu has its own all-vegan section and is full of crowd-pleasing favorites like hot dogs, burgers, grilled cheese, BBQ sammies, and pizzas. Plus salads, for those who want to eat their greens in between fruity drinks and fried indulgences. This retro-inspired spot just opened its doors at a new location in the hippest of Raleigh neighborhoods. The perfect locale for both omnivores and vegans, this eatery has an extensive menu of burgers, sammies, blue plates, and salads, too — plus Saturday and Sunday brunch and a cornucopia of cocktails. On the vegan side, popular options include award-winning non-chicken wings with buffalo sauce and (the best ever) ranch; fried vegan chicken with mac and cheese and fried broccoli; vegan lasagna with Impossible burger crumbles; a vegan BLT; a tempeh reuben; and tangy, indulgent key lime pie (note: all desserts are vegan). This cozy all-vegetarian and mostly-vegan spot sits in the midst of breweries, bars, and start-ups, and offers a super-fresh menu that focuses on locally sourced ingredients and seasonal produce. Try the vegan pimento cheese with onion jam; the cornmeal-crusted fried oyster mushrooms; the BBQ pulled “pork” with smashed potatoes; or the nori rolls with sashimi tofu. They also offer brunch, where you can dig into a fried “chicken” biscuit with blackberry jam; tofu huevos rancheros; and French toast and soysage. A meeting place for vegans and non-vegans alike, this light, airy eatery is owned by two former yoga teachers and long-time vegans. With a dearth of veg-friendly options in Charleston, they decided to break new ground — and ended up with a diverse array of fans and customers. Open for breakfast and lunch, popular items include the southern grit bowl, the hemp sausage biscuit, the veggie burger, and the mushroom BLT. This delightful, art-adorned and cruelty-free cafe was the first 100 percent vegan eatery in the area. Owner Folami Geter was raised vegetarian and has never eaten meat — so plant-based food is what she knows best. After buying the restaurant from her father, she focused on familiar foods that eaters of all kinds would be able to enjoy.